Seven-time NASCAR Cup series champion Jimmie Johnson has revealed his car swap with McLaren Formula 1 driver Fernando Alonso was the Spaniard’s idea. Johnson will hand over his Hendrick Motorsports Chevrolet Camaro to Alonso at the Bahrain Grand Prix’s Sakhir Circuit at the end of the month, with the car already travelling by sea to the circuit. Alonso will give his McLaren MCL33 to Johnson after the American undergoes simulator training at the F1 team’s base. Johnson and Alonso, via Skype, held a joint press conference at Phoenix ahead of this weekend’s race and the Hendrick driver explained how the swap came to be. “Honestly, the January press conference or press day that we had in Charlotte, North Carolina for the NASCAR series is when Fernando and I had a chance to meet and kind of throw this idea into motion,” said Johnson. “Fernando was coming through on his way to the Rolex 24 and we had a chance to meet. “He only had to mention it once, he said ‘hey man, would you ever want to trade cars? I’m like ‘heck yeah”. “Immediately, we started the process with our teams and it’s been a very fun process. “Everyone at McLaren has been fantastic. “It’s been great to watch Formula 1 with a whole new interest knowing that I get a chance to drive Fernando’s car and go watch the final race in Abu Dhabi and then have a chance to driver the car in Bahrain. 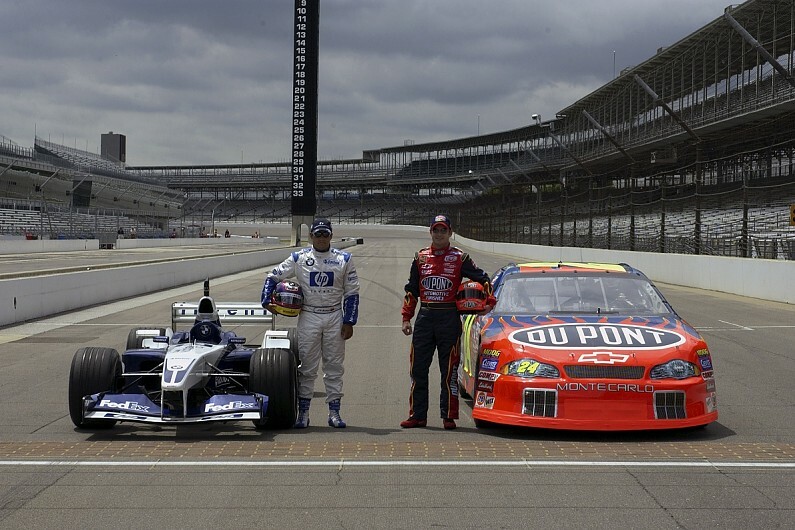 Johnson adds that he has leaned on Jeff Gordon – who drove a BMW F1 car in a ride swap with Juan Pablo Montoya back in 2003 (pictured above) – and that the former NASCAR driver has told him to build up his neck muscles. He said: “Well the first thing I think is going to be to have fun. “We all love racing, any type of racing and to test for the very first time a NASCAR car with the huge following and all the repercussion that NASCAR has in the world of motorsports. “For me [it’s] the first thing that I want to experience and I want to have that opportunity in life and it’s happening now in a couple of weeks’ time. “I think ultimately you want to be a better driver in the future, so I probably will learn things from the team, I will learn things from Jimmie and different driving styles, different techniques, different approach of racing and all of that will make a better driver for myself. That is the second thing. “To racing in the future, I think the first thing is to test the car, to see how it feels, to see how enjoyable it is to drive it and who knows in the future.